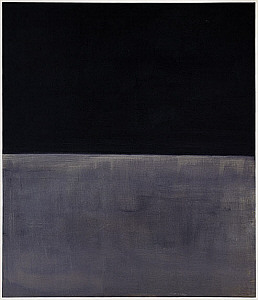 Untitled (Black on Grey) was completed by Mark Rothko in 1970 and touched on the topic of death, which was a key theme in the life of Rothko. The darkness here contrasts with the brightness of other pieces that he produced across his career, and therefore Untitled (Black on Grey) underlines the differing moods that Mark Rothko endured throughout his life. This Untitled painting came very close to his death soon after and a lot can be understood about his mindset around that time. Many of his works were dark and depressing around this late stage in his career and contrast massively from what had come before. This final period of Rothko’s career, titled his Black and Grey period also came about at a time where his own health was deteriorating physically, as well as mentally. A close inspection of the canvas will reveal the various tones found within the grey and black blocks, Rothko rarely produced color blocks in a uniform shade. National Gallery of Art, Washington, D.C. holds this painting amongst it’s permanent collection, and it is acrylic on canvas, which is standard for this artist.